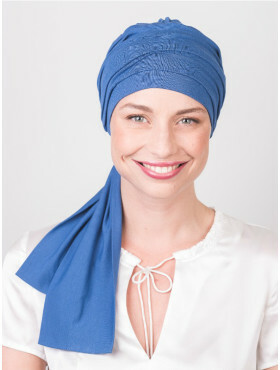 There are not that many chemo scarves out there that are this easy to slip on and also look as gracious and trendy as this Liz cancer scarf in Yogi. Recommended if you like an elegant style but lack the draping and wrapping skills. Slip it on like a hat, tie the ends once in the nape of your neck and that’s all there is to it! Night blue basic hat with a sewed-on a white scarf with delicate houndstooth print and blue patches. The delivery terms above are only an estimated and may sometimes be affected slightly by strikes or other unforeseen circumstances. If an article is sold out or delayed, we will notify you by e-mail. Rosette la Vedette was founded by Wendy Rosseel. She started to design her own chemo scarves and hats when she was diagnosed with breast cancer. Wendy understands better than anyone that you don’t to choose between pretty and comfortable: you want both. That means soft fabrics without scratchy stitching, in trendy colours and prints. In just a short time, Rosette la Vedette has become the favourite brand for people with hair loss caused by chemotherapy or alopecia. Our items are designed in Belgium, recommended by numerous hospitals and cancer specialists and a hit with the press and fashion stylists.